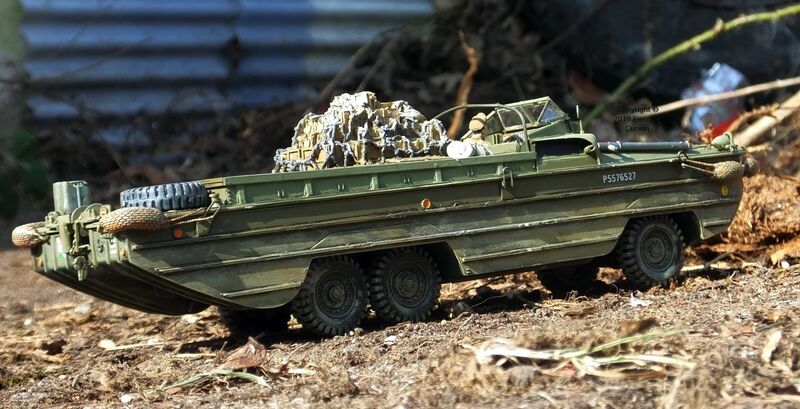 This page continues from World War 2 plastic models part 1. World War 2 spanned five years, from 1939 to 1945. This page covers (broadly) the second half of that war. 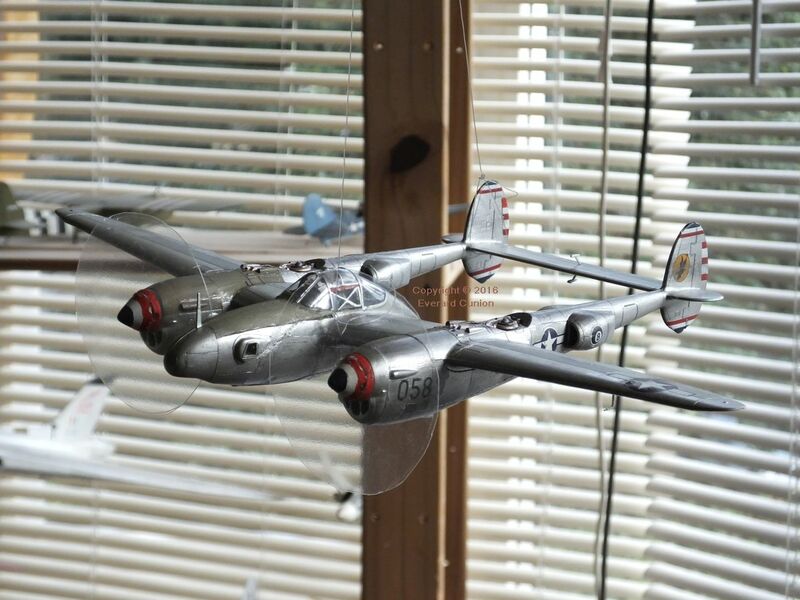 This Academy 1/48th scale kit is a photo-reconnaissance variant (F-5) of the Lockheed P-38 Lightning. It has a span of more than 12 inches in this scale. As is often the case with modern kits, it does not include a pilot, which I had to source separately. The one part with a poor fit is where the nose joins on to the main fuselage at an angle; just on the port side, you can see where I used some filler (not very well finished). The fighter version was flown in World War 2 by Robin Olds, who later commanded the 8th Tactical Fighter Wing flying F-4 Phantoms over Vietnam. The French writer Antoine de Saint-Exupéry (‘Le Petit Prince’, ‘Flight to Arras’, ‘Wind, Sand, and Stars’) was killed flying a photo-reconnaissance example during World War 2. My first combat was anticlimactic. 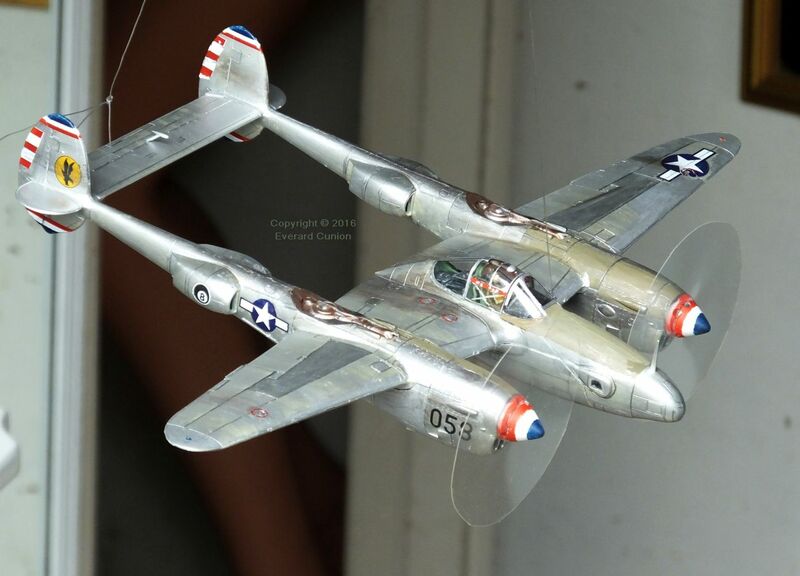 I saw a few halfhearted puffs of flak but sure loved the hot-metal smell of my new P-38, the odors of oil, hydraulic fluid, ozone from the radio tubes, leather from the seat, and the faint whiff of residual perfume from the WASP pilot who had delivered it. 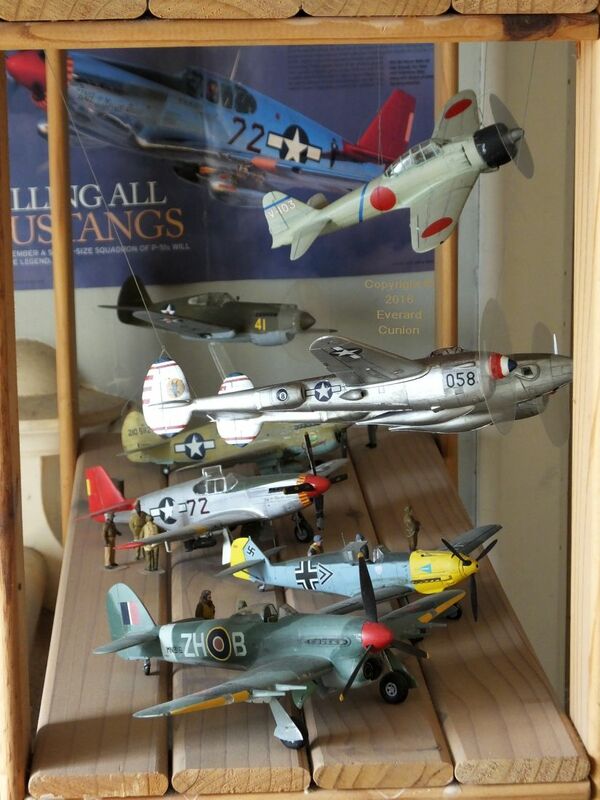 This 1/48th scale Curtiss P-40N is the Hasegawa kit. The green jacket is the wrong color. I will get round to repainting it one day. 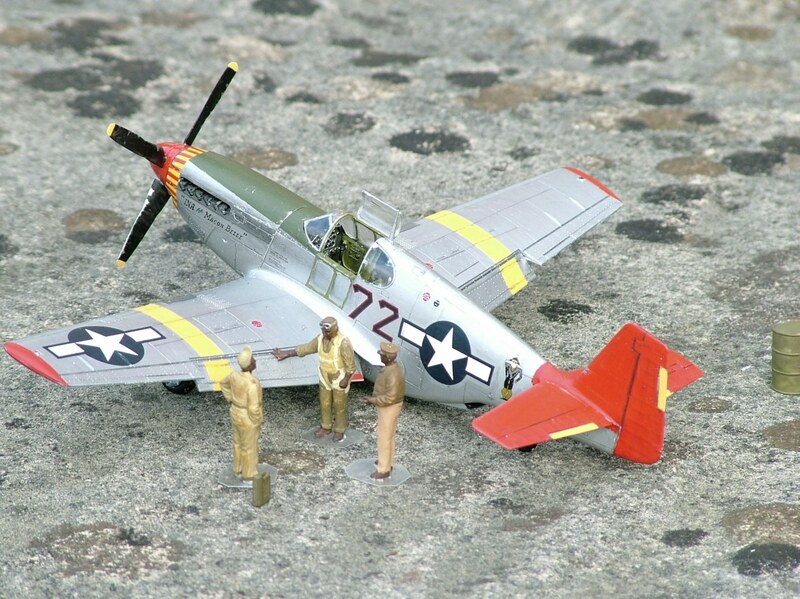 I finished this 1/48th scale P-51 as a ‘red tail’ of the 332nd Fighter Group of the U.S. Army Air Corps. The accuracy of the artwork on the fuselage by the tail is questionable. 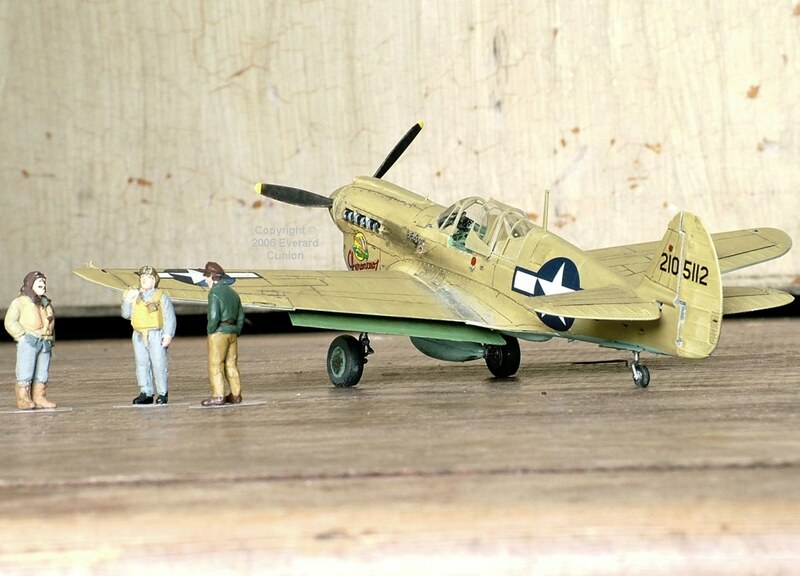 One surviving pilot of the ‘Tuskegee airmen’ said they modified the ‘Chinaman’ figure, which some of these aircraft already had painted on them when they received them from a previous squadron, to resemble a black man (in self deprecating humour). The figures are an inch and a half tall. This 1/72nd scale (the gentlemen’s scale, apparently!) Spitfire PR XI has a six inch span and is five inches long. It is a ‘resin’ kit that I made in about 1996 and refurbished in 2019. The PR XI, which the Americans also used, was the only Spitfire that could fly from its base in England to Berlin and back. It was a Mk.IX modified by removing the guns and installing fuel tanks in the wings instead. They installed cameras in the fuselage, took out the armour plating, and replaced the armoured windscreen with a smoothly curved one. The oil tank was also enlarged and it was housed at the front underside at the nose, resulting in a different curve there from that of the Mk.IX. 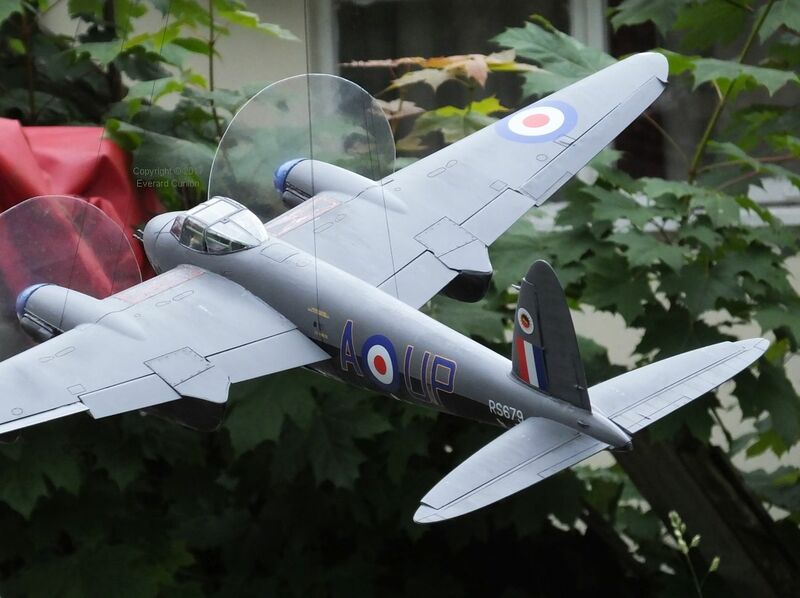 Allied photo reconnaissance aircraft were usually painted in this fairly dark grey with a blue tint, referred to as PR blue. 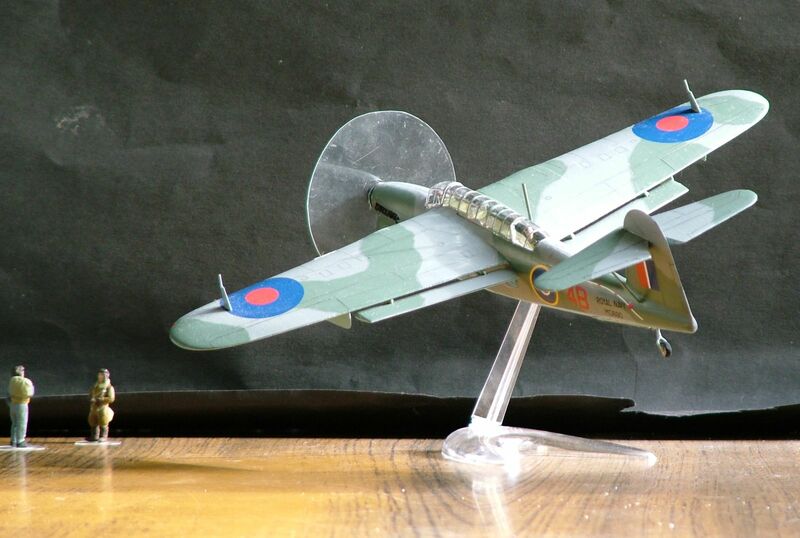 This is the 1/72nd scale Italeri kit of the Airspeed 51 Horsa assault glider. It has a span of more than 14 inches. The figures are one inch tall. 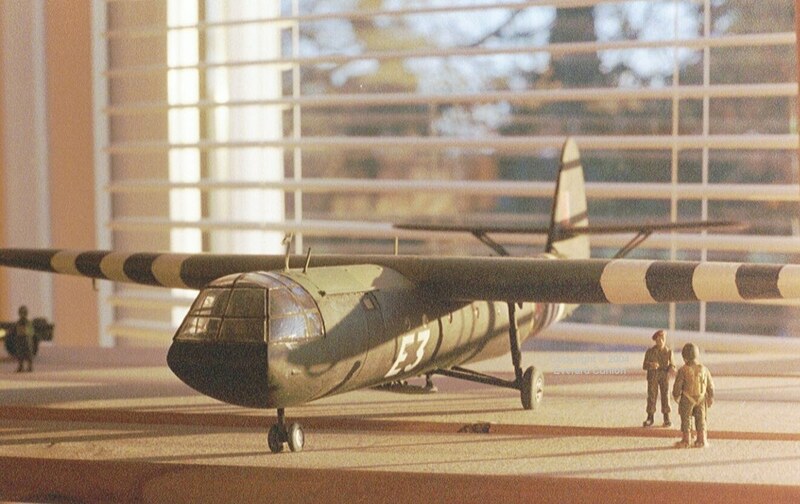 The US equivalent of the Airspeed 51 troop-carrying glider (note the absence of engines and propellers) was the Waco CG-4A. I read that Waco was originally the Weaver Aircraft Company of Ohio. It was renamed the Waco Aircraft Company in either 1928 or 1929. The cockpit details of this Italeri 1/72nd scale kit are fictional, so it needs a lot of work if you want that detail. Apart from that, it is a good kit. It has a 14 inch span. It was remarkably sobering to see the hundreds of American and British gliders littering the fields and orchards. Some were intact, but many had run head-on into the hedgerows bordering every open space and lay there smashed in crunched-up heaps. Their invasion stripes stood out starkly against the green of the fields, and I felt a pang at the thought of the men on board those wrecks. The helicopter replaced the aerotowed glider as the preferred method of inserting troops behind enemy lines after World War II. 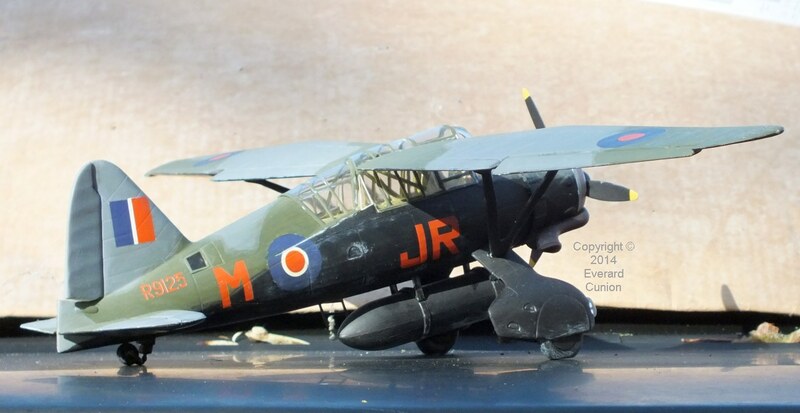 My 1/32nd scale Westland Lysander, which I think is a Revell kit, is fairly large because it was a surprisingly large airplane. About 1942 or 43 the RAF changed from green and ‘dark earth’ on the upper surfaces of most aircraft to green and ‘dark sea grey’. 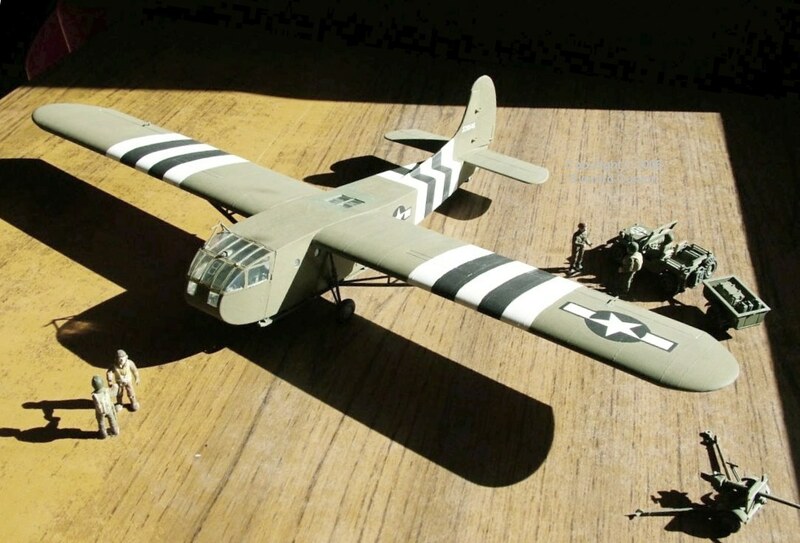 Bombers, however, continued with green and dark earth uppers. 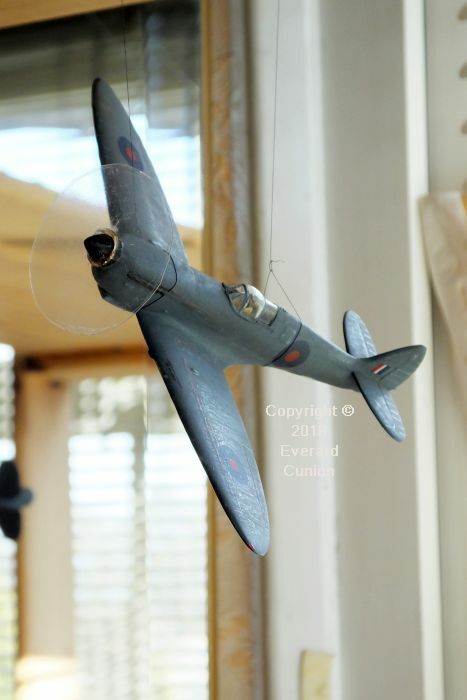 I finished the Hawker Typhoon (nearest) as one of those that shot down a Ju188 on the edge of the New Forest in May 1944. For some of the consequences of that event, see Shooting a line—my review of Requiem for a Wren, by Nevil Shute and Requiem for an aircrew, my review of a book about the mystery of the Exbury Ju-188. This is the Hasegawa kit. They also make a version with the earlier ‘car door’ style framed canopy.